Sweet, velvety organic chestnuts for festive cooking. They come cooked and peeled, so that’s one less job to deal with! And the quality and flavour is by far the best we’ve found. Pair with sage and apple for a tasty stuffing, use in vegetarian main courses, or throw them in with Brussels sprouts and bacon for hearty a Christmas side. Try stuffing vegetables, poultry or fowl with them, or try them with bacon and sprouts. 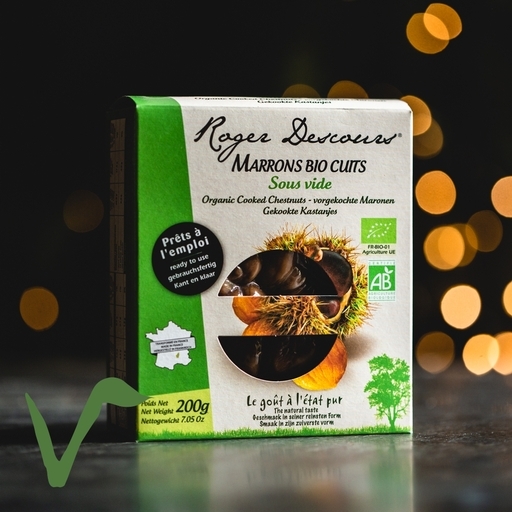 These chestnuts are produced by a co-operative of small-scale farmers in the L'Ardéche region of France. The chestnut trees grow well in the mountainous terrain where it is difficult to grow much else, so they are an important part of the local economy. The crop is harvested carefully by hand, as the land is too steep for machinery.